The worlds first pizzeria is widely believed to be Antica Pizzeria Port'Alba in Naples, Italy. Operating since 1830 the restaurant serves the two original 'pure' pizzas, the margarita and the marinara. The margarita, representing the colours of the Italian flag, is one of the simplest yet pizzas hardest pizzas to perfect. The base has to be crispy and the crust fluffy. The tangy tomato sauce must not be too wet and the amount of creamy mozzarella has to be bang on. The equation starts with the dough and finishes with how you get an oven to 450 degrees in order to drive any moisture out of the pie in super quick time. Beginning with the most important part of the pizza, the dough. Make a well with the flour and add the water (bit by bit) to the middle along with the yeast, oil, salt and sugar. Incorporate everything and knead for 10 mins-15 mins. This stage cannot be rushed as it is vitally important to knead until it becomes smooth and elastic, if the dough is still sticky keep going and add more flour to your surface if necessary (which it will be!). Place in a flour dusted bowl and cover with a damp tea towel. Leave to rise for 45 mins to an hour. For the sauce simply add ingredients to a sauce pan and mix well. 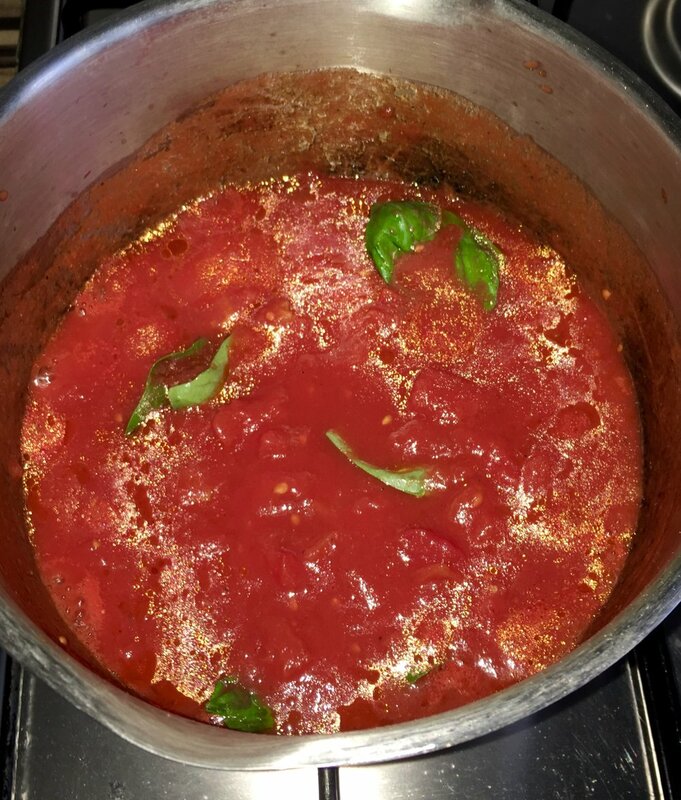 Let the sauce simmer for around 10 minutes on a low heat. You want the sauce to reduce for two reasons. Firstly the less moisture on top of a pizza the better, for obvious reasons, and secondly to concentrate the flavours. After an hour remove the dough from the bowl and cut in half. Manipulate the dough to the size you desire. I prefer a slightly thicker pan pizza rather than an extremely thin base but roll out as you wish. Once the dough is rolled spoon on the sauce and top with the mozzarella. I usually squeeze the mozzarella slightly with kitchen roll to ensure no unnecessary moisture leaks onto the base. To finish add a few basil leaves and drizzle with olive oil. If in doubt about quantity always go with less is more. Now for the fun part! I recently purchased a kettlepizza which is essentially a piece of metal that extends the height of a kettle BBQ transforming it into an oven. This allows the temperature of the oven to reach in excess of 420 meaning the pizzas only take around 4 minutes to cook! Lump-wood Charcoal is used along with wood which not only gets the oven up to temp but gives an excellent wood fired taste. Turn the pizza using a peel after two minutes to ensure the pizza cooks evenly. After 4-5 minutes you should be done! In a conventional oven set the temperature to max and pre-heat a pizza stone for around 20 minutes. Slide the pizza onto the stone using a floured piece of parchment paper and cook for 8-10 minutes.